If you have read books or articles about greenhouse environmental control you have probably heard about Vapor Pressure Deficit, also known as VPD. This is an important variable to measure as it helps us understand the conditions our plants are facing, gauge their water use and even predict whether we will be getting better or worse yields. Today I am going to talk about vapor pressure deficit in hydroponics, what this variable means, what it takes to control it and why it is so important to understand and even change this value to obtain better results. Vapor pressure deficit - measured in kPa - basically measures how much water vapor pressure we would need to put into a room with a certain humidity and temperature to get it to the point where relative humidity would be 100%. The larger the VPD the more water you need to put into the air to get it to saturate while the lower the VPD the closer the air is to full saturation. Since air holds more water with increasing temperature this means that at a fixed relative humidity the VPD is directly proportional to the room's temperature. This simply means that the hotter the room, the higher the VPD and the colder the room, the smaller the VPD if humidity remains constant. The problem with a very low VPD - room close to 100% humidity - is two fold. First, it's difficult for any organism to evaporate water and second, it's easy for water to condense on any surface it temperature drops just a bit. For humans this basically means having to wear a t-shirt soaked with your own sweat but for plants this means both an inability to cool their surfaces and an inability to transport nutrients to their leaves. A low VPD generates a lot of stress because it makes plants unable to properly transport water. A high VPD is equally problematic as it means that the plants need to transpire a lot. If air can hold a lot of additional water vapor this means that plants will lose more water through their stomata and this permanent loss puts pressure on the roots to transport more and more water. If root mass is not large enough or water availability is not high enough then plants will face important problems and will simply tend to wilt as the air takes away more water than what the plant can effectively transport through its tissues. You can actually often create models using VPD to predict a crop's water usage (see image below). The first graph in this post (which I took from this study on tomatoes) shows the optimum VPD - in green - as a function of humidity and temperature for greenhouse production of tomatoes. In general a range between 0.5 and 1.1 seems to work best but the window under which these conditions are possible becomes narrower as temperature increases. Ideally we would want to be somewhere around 20-25°C where we should sustain humidity values between 65-70%. 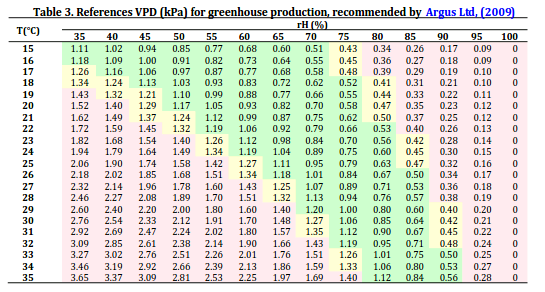 This would give us a VPD value between 0.7-0.8 which is around what is commonly held to be most beneficial for greenhouse crops under normal conditions. However optimal VPD can also change depending on lighting conditions and other sources of supplementation. For example the optimal VPD during the day is usually higher than the optimal VPD during the night. In general it's better to have a drop in VPD during the night relative to the VPD that is maintained during the day. Declines in canopy carbon dioxide exchange rates can be correlated with increases in the VPD during this time (see here for a study about this on soy bean). 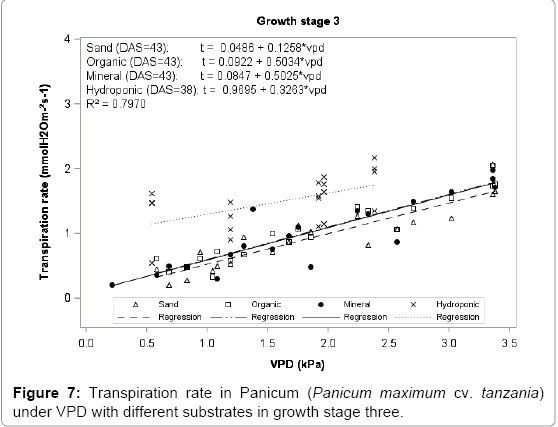 If you're supplementing carbon dioxide - which puts further transpiration stress on the plants - the optimal VPD is also likely to be lower than if you didn't use any supplementation at all (you can see a practical application of this here). Changing the VPD can be a challenge but under closed environments it is much easier to do. You can reduce the humidity using a dehumidifier to increase your VPD and you can use a humidifier to increase your VPD. Ideally you will want to use an AC unit to keep your temperature at exactly the value you want it to be and you can then use a humidifier/dehumidifier to control the exact point where you want your VPD to be by controlling the value of your relative humidity at the fixed temperature provided by the AC unit.